Following yet another home win over a ranked opponent (feels good, don't it? ), Alabama (13-7, 4-3) will return to the road for the first meeting of the season with the Auburn Tigers (KenPom: 15; NET: 24). Auburn enters this game with a 14-6 (3-4) record. Game time Saturday is 7 P.M. CT. ESPN2 will handle the television duties. My Two Cents: Sometimes you have to win ugly games, and not all ugly games have scores in the 40s or 50s. In my opinion, the Tuesday game between Bama and Mississippi State wasn't pretty for either team, but someone had to win. Fortunately, our guys emerged with another quality win to add to the resume. Alabama emerged from Tuesday night with eight total quad one/two wins. Unfortunately, Ball State, which was regarded as a quad two win earlier in the week, fell into quad three status after falling out of the top 100. Therefore, Bama's quad one/two record is now 7-4 (2-4 vs quad one teams). Also of concern is that Arizona is flirting with falling into quad three status as well after losing their third straight game on Thursday night. Alabama needs the Wildcats to remain in the top 75 so they can continue to count them as a quad two win. Let's remember that as we pull for Alabama to win each and every game, we also need to hope that their non-conference opponents make gains as well in order to keep the resume in its best possible state. Auburn had lost three straight before their convincing 92-58 win over Missouri on Wednesday night. Despite some struggles this season, Auburn has remained ranked high at KenPom and the NET. In Auburn's defense, those three losses were by a combined total of 13 points, with two on the road (at South Carolina and Mississippi State), and the other coming at home to a Kentucky team that has finally turned on the warm jets. Honestly, aside from a poor second half at Ole Miss, there's nothing on Auburn's resume that suggests they're a bad team. What the resume is lacking are quality wins (just 1-5 vs quad one teams, and 5-6 combined vs quad one/two) so Auburn is going to have to win games against the better competition on their schedule if they're going to get a good seed in the NCAA Tournament. As we've come to expect of Auburn under the direction of Bruce Pearl, the Tigers are one of the better offensive teams in the country. They're currently ranked 9th in adjusted offensive efficiency at KenPom. Their effective field goal pct is 54.3%, which is 43rd in the country. Stop me if you've heard this, but Auburn is a great offensive rebounding team. The Tigers are currently ranked 11th in the country in offensive rebound pct. 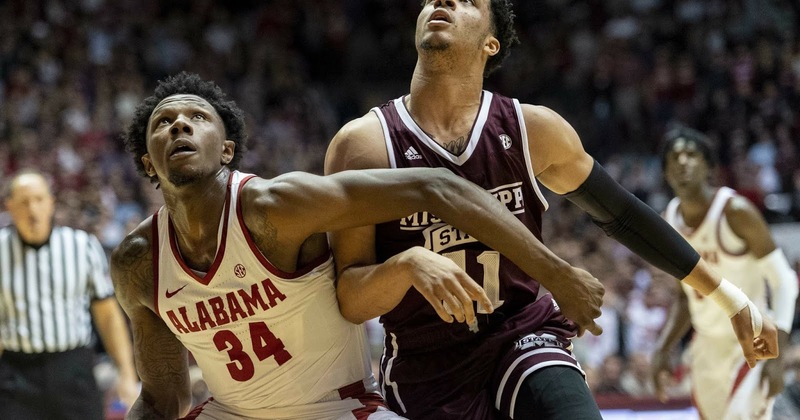 Considering that Alabama has allowed a combined 35 offensive rebounds in its previous two games, that's a cause for concern. I certainly hope it's been drilled into the Alabama players this week in practice that Auburn likes to shoot the three. 46.8% of Auburn's field goal attempts are threes. 40.6% of their point distribution comes from the 3-point line. They make 37.4% of their attempts, which ranks them 50th in the country. They have five players in their primary rotation that make 38% or better from the 3-point line. Our guys have to limit clean looks for Auburn because if they get hot, they will bury you quickly, especially at home. On defense, the Tigers are ranked 1st in the country in two categories: opponent turnover pct (26.1%) and block pct (18.6%). They're also ranked 8th in the country in steal pct (12.4%). Auburn thrives on turning defensive stops into points. Alabama has made some improvements in ball security as the season has progressed, but this is going to be a raucous environment that will test Alabama's poise. Auburn would love nothing more than to turn a couple of turnovers into quick points and feed on the crowd response. Alabama's turnover pct may prove to be the most important stat in this game. Also of concern is Alabama's transition defense, which has been abominable at times this season. If it's bad on Saturday night, particularly when Auburn forces turnovers or blocked shots and gets out in transition, this one could get ugly for our guys quick. I can't stress enough that ball security, shot selection and transition defense have to be strengths for Alabama on Saturday night or they've got no chance to beat these guys. It's not all wine and roses for Auburn. Because they attempt such a high percentage of shots from the perimeter, they don't get to the foul line much (ranked 273 in free throw rate). On the flip side, their opponents get to the line frequently. Auburn is ranked 304 in opponent free throw rate. If Alabama can get to the free throw line consistently, it could take the Auburn crowd out of the game while allowing themselves easy scoring opportunities (assuming they can make the foul shots, of course). While Auburn is a good offensive rebounding team, they also allow their opponents to rebound at a high rate. The Tigers are 305th in opponent offensive rebound rate. Despite the struggles on the defensive side the last two games, Alabama has been a consistently good offensive rebounding team. They need to hit the glass on Saturday night and create second chance opportunities for themselves. This Alabama offense is the most efficient (ranked 43rd in the country) we've seen in at least a decade. If they can create second and even third chance opportunities for themselves, I feel confident they can cash in on those opportunities. Finally, Auburn is ranked 253 in opponent 3-point pct (35.8%). Alabama had a horrendous 3-point shooting night this past Tuesday (1-15). While they are a below-average 3-point shooting team (33.4%), they're certainly better than what we saw on Tuesday. Alabama doesn't need to get in a shooting contest with Auburn, but I do think they need to make more than one three in this game if they're going to win. Players to Watch: This will likely be the most intense road environment that Kira Lewis has seen this season. Kira has exceeded expectations in his freshman season, but I do think it's fair to say that he's had more freshman moments (poor shot selection, unforced turnovers, etc.) as the season and conference play has progressed. Being that he's the primary ball-handler, how he handles the Auburn pressure and the road environment will go a long way in how this game plays out. You can bet that Pearl will want to pressure him early and often to see how he holds up. Jared Harper and Bryce Brown are the most consistent players for Auburn, and Austin Wiley may be the best pro prospect (he's been out with injury; his status for this game is unknown at the time of this post), but the x-factor for this Auburn team is Chuma Okeke. A pro prospect in his own right, Okeke is the type of inside/out stretch forward that has become de rigueur in the game. He's averaging 10.6 ppg, 6.3 rpg, 2.2 apg, 1.5 spg, 1.2 bpg, 49.4% FG, and 33.3% 3-PT. In the game at Auburn last season, he was a problem, finishing with 16 pts, 10 rebounds, 3 assists, 2 blocks and 2 steals. Prediction: Alabama is 0-3 at Auburn during Avery's tenure, losing the three games by an average of 15 points. The last two games have been particularly painful, with Auburn winning 84-64 in 2017 and 90-71 last season. If you're new to this whole Alabama basketball fan thing, it's important to know that losing at Auburn hasn't just been an Avery Johnson thing. The program is 3-7 in its last ten trips to Auburn, and five of those losses were by double figures. If you think the Auburn magic only happens in Jordan-Hare Stadium, wait until their basketball team shoots 65% from three on Saturday. Frankly, I'll be happy if Alabama keeps this one close. Unfortunately, recent history suggests that's not going to happen.